From 1985 Porsche started to offer a 16” wheel option. Michelin currently make 205/55 ZR 16 Michelin SX MXX3 and also the 245/45 ZR 16 Michelin SX MXX3. Pirelli also now make , 205/55ZR16 Pirelli P7 N4, 225/50ZR16 Pirelli P7 N4 & 245/45ZR16 Pirelli P7 N4 what is also interesting about the new P7 tyres is they are tested and homologated by Porsche with the N4 designation. It is worth looking at the Fitment guide by Porsche and the independent article by a German Classic car magazine which offers a back to back tyre test and the bottom of thus page. Also, don't forget to check our Early 911 Blog page. Early Porsche 911 originally fitted a 165R15 tyres. They fitted a variety of different brands of tyres, including Michelin and PIRELLI CINTURATO ™. Currently Longstone tyres would suggest that the best tyres for these pre 1968 early 911 cars would be either the 165HR15 PIRELLI CINTURATO ™ CA67 which came out in the ‘50s or the 165HR15 Michelin XAS Which came out in 1965. Both brands are excellent period tyres, made by two of the world's best tyre manufacturers to the highest standards, they will give perfect handling characteristics while also being genuine original equipment..
Porsche themselves have now become involved in sourcing classic tyres for their historic cars, and giving them their seal of approval, in the form of a "N4" marking, meaning they have a Porsches Homologation. In doing so they have made a 165 VR 15 PIRELLI CINTURATO ™ CN36 N4. Having the V speed rating is great and appropriate to these early 911 cars. Although the CN36 tread pattern did not come about until 1968, by which time the 911 was fitting a 185/70VR15. Interestingly Porsche widened their rims from the 4.5” Fuch alloy to a 5.5” Fuch alloy in 1967, but they continued to fit 165R15 tyres. These wider rims gave greater directional stability. It wasn’t until a year later in 1968 where Porsche moved onto fitting 185/70VR15 tyres front and rear. In the day the 185/70WR15 Pirelli Cinturato CN36 or 185/70VR15 Michelin XWX were the best of the OE tyres, and we would suggest today if you have a late ‘60s or ‘70s cars then they would still be the best tyres for an early 911 today. Initially fitted all round; I85/70VR15 tyres were the mainstay tyre for the 911 right through to the 911 SC until August 1986 where they changed the front tyre to a 195/65R15. However over nearly 2 decades there had been a variety of changes made to the cars geometry that makes a 911 more suited to the modern tyre carcass of a 65% profile tyre on the front axle. In 1972 on the 911 Carrera and RS models Porsche fitted a wider rear wheel and fitted 185/70WR15 Pirelli Cinturato CN36 on the front and 215/60WR15 Cinturato CN36 on the rear. We are fortunate, to be able to provide these tyres again made by Pirelli with the N4 Porsche homologation. As the years went by the various models of 911, moved over to fitting a wider rear wheel. 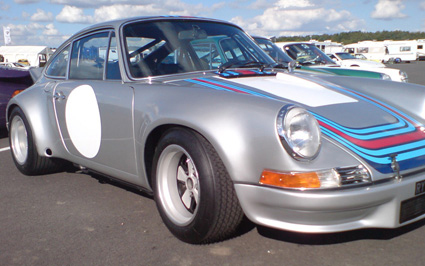 Even with later 1980s cars like the 911SC they were still fitting 185/70VR15 on the front and 215/60VR15 on the rear. We would suggest that the Cinturato CN36 N4 tyres are the best. We have information on Porsche 930 Fitment here. In 1968 Porsche fitted wider rims to its early 911 cars and changed the tyre size to 185/70VR15. We believe that the earliest cars were offered with either Continental, Dunlop or Michelin XWX. In 1969 PIRELLI developed their low profile tyre developed in conjunction with Porsche, the CINTURATO ™ CN36 which became the tyre of choice on these early 911's. Porsche have recently been involved with PIRELLI producing and homologating the 185/70WR15 PIRELLI CINTURATO ™ CN36 N4, which would be the tyre of choice along with the other original tyre the 185/70VR15 Michelin XWX. In 1972 with the 911 Carrera, Porsche started to fit a larger rear wheel with the tyre size 215/60R15. Fortunately in conjunction with Porsche, PIRELLI produce the tyre 215/60WR15 CINTURATO ™ CN36 N4, homologated by Porsche for their top of the range early 911, such as the Carrera, RS, 911S, 911 Targa & Turbo models. If you are wanting to take your car on the track there are a wide range of options available. Dunlop Racing and Avon CR6ZZ for the early 911 and Michelin's extraordinary TB range of road legal rally tyres for wider wheels, offering options up to 13" wide wheels. There is the full tread Michelin TB15, and the semi slick Michelin TB5 F & R with it's choice of front and rear compounds, and the full wet Michelin PB20. Pirelli’s commitment to these fabulous early high performance 911 Turbo’s, Carrera, RS, RSR etc are also backed up by their range of Pirelli Cinturato P7 tyres. In the Mid ‘70s when the 930 came out they were fitted with 205/50R15 Cinturato P7 on the front & 225/50R15 Cinturato P7 on the rear. Some of the RSR cars had 11” wheels with 285/40R15 Cinturato P7 tyres on the rear and 9” wheels with 225/50R15 Cinturato P7 on the front, all of which fortunately are being made again by Pirelli. When the first Porsche 911 came on to the market sporting a 2-litre 130bhp engine, they were up against some extremely good sports cars. Aston Martin DB6, E-type Jaguar and Ferrari 275 GTB were just a few of these cars. The first Porsche 911, it has to be said, was definitely not a car for the mainstream. The 911 driver of the time wanted fast thrills with no frills! The earliest 911's were built from 1965 to 1969 and were short wheel base models many of which are now seen thrashing around in all their glory at historic race and rally events. These particular cars tend to be the most desirable amongst the for mentioned group of petrol heads. The next of the Porsche 911's were built between 1970 and 1973 with engines ranging from 2.2 - 2.4 litres. These cars were followed shortly by the arrival of the impact bumper model in 1974, with the top model sporting a 3.2 engine and given a Carerra badge. Another of the Porsche range was the 2.7 R.S, which was brought out between 1972 & 1973. The Porsche 911 2.7 R.S (R.S standing for Rennsport meaning motorsport/circuit racing in German) sported wide arches and wheels, lighter body work, stiffer suspension and of course a powerful 2.7 engine. This car would prove to be the start of the R.S series and what was to be a successful racing pedigree. Shortly after the Porsche 911 R.S.R 3-litre and Carrera R.S.R Turbo were produced, though only in small numbers, making them eligible for racing. Porsche had almost immediate success with one of their Carrera R.S.R Turbos finishing 2nd at the Le Mans 24 hour race in 1974. The engine used in the Carrera R.S.R Turbo would go on to form the basis from which Porsche would make many assaults on the world of motor sport racing and not only that but also the start of Porsche fitting turbos to their cars. In the world of modern tyres it is common place to come across a tyre test. However in the world of classic tyres the investment never seems to be there to do a proper modern tyre test. However a German magazine in July 2016 conducted this modern tyre test on classic Porsche tyres. This classic Porsche tyre test has been translated from German to English. What is remarkable in this tyre test is quite how well the PIRELLI CINTURATO ™ CN36 classic Porsche tyres performed in the table at the end. The scores in this table are not scored in relationship to the other tyres in the test, so when a score of 1 is recorded, then that is a perfect score for a classic tyre or a modern tyre. It is wonderful to see that these classic Porsche tyres can give such exemplary results. The simple time honoured shape of a Porsche 911 has been something that has inspired classic car enthusiasts for years. The refined elegant pure shape is unmistakeable. Now Longstone tyres, with the support from the world's best tyre manufacturers are able to supply tyres for classic 911's. Below you will find a classic Porsche fitment guide and an independent article written about the tyre choices for your classic Porsche.